Look no further than your backyard for the perfect getaway. 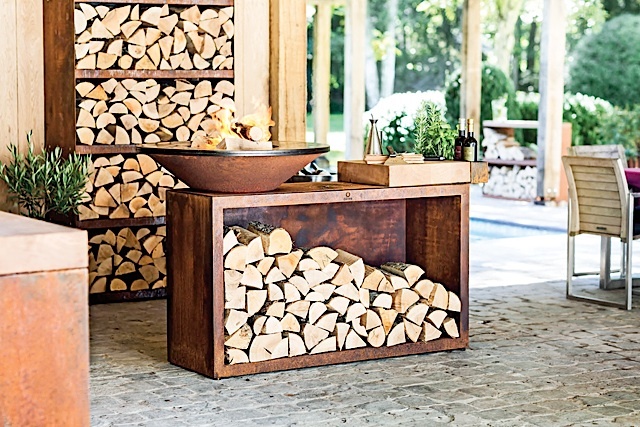 Thoughtful, creative designs for outdoor living can transport you to a relaxed state right after rush hour every day. 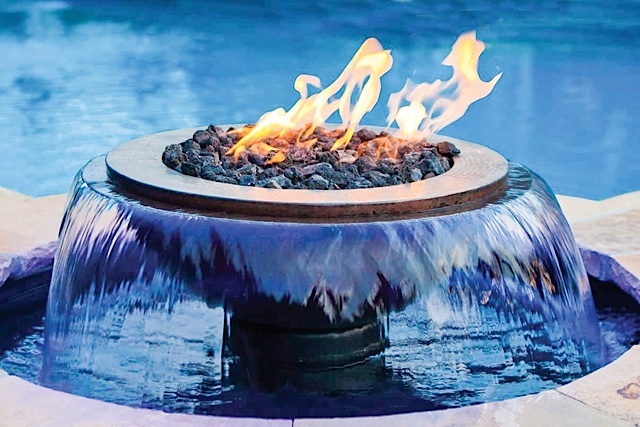 In addition to the beautiful, functional materials widely available for outdoor living, the elements of fire and water are more prevalent than ever in design. New products and technologies make it possible to both feel the heat and experience tranquility by incorporating fire, warmth, and water throughout your outdoor living spaces. To guide you, we’ve pulled together some of the latest innovative products that showcase this lifestyle and open up the possibilities for embracing the outdoors — even beyond our Minnesota seasonal norm. This hot new grill from Holland will help you bring beauty, warmth, food, and friendship to your outdoor space. The OFYR Grill is as much a barbecue grill as it is an art piece for your garden. It will expand your definition of outdoor living. This wood-fueled grill features a wide, flat rim that doubles as a hot plate. The flat rim provides a smooth temperature gradient, which allows for a wider temperature range for precise cooking. Fry eggs, steam vegetables, or sear a tender steak. The OFYR outdoor cooking system includes a butcher block, solid-wood cutting board for food preparation, a sturdy steel grate for cooking directly over the wood fire, and cedar planks to add a touch of smoke to the flavor of your food. Simply soak the cedar planks in water for an hour before use and enjoy the complex smoky flavor this technique adds to your fish, seafood, or meat. Salmon is particularly good on a cedar plank! The OFYR system also includes a Corten wood storage bench for stylish seating and doubles as storage for your wood supply. This modular system may also include a steel storage unit to transform a stack of wood into an attractive wall. Now that’s functional art! As if the conversation wasn’t heated enough, place a firetable in your outdoor living space and that’s all your guests will be talking about. 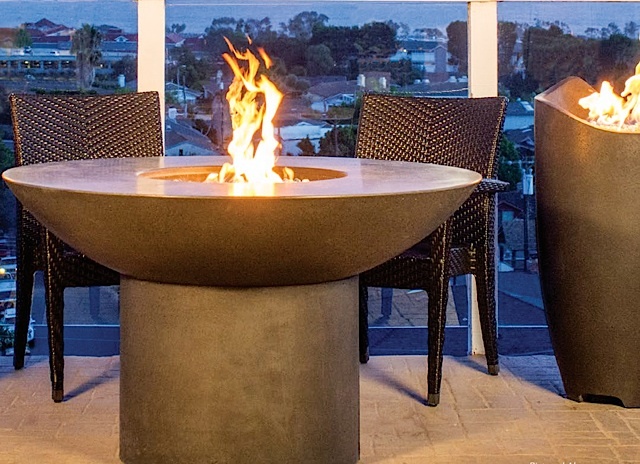 We like the American Fyre firetables with natural gas or self-contained propane tank fuel options that are handcrafted from glass fiber reinforced concrete (GFRC). It’s also a bonus that they’re modularly constructed as easy-to-assemble components that fit easily into most backyards, making installation fast and simple. These tables, complete with glass wind guards, come with so many attractive media/accessory options to frame up the picture-perfect fire, we find it hard to choose! Select from glass in 16 different colors, designer pine cones, RiverRock or Creekstone, obelisk geo shapes, or lava coals. Swap them out as you like. American Fyre offers either a chat height or dining firetable to bring fire to your fingertips. Either way, you’re no longer far from warmth because the firetable provides the heat with an instant ambiance right in front of you. And if you’re looking to squeak in a few more weeks of outdoor dining on either end of the season, this product can dramatically improve warmth over the evening chill. Here’s to chilling out longer. The element of fire in designs by Tempest Torch is all about welcoming and wayfinding. Much like tiki torches firmly planted in the sand might beckon you to an island oasis, this product’s spiral-like presentation of fire gives off that same vibe. The torches are made of tempered glass and designed to direct the oxygen needed for combustion in a pattern that increases the flame velocity and lends a dramatic effect. Frequently we see these placed right next to the home and carried through outdoor spaces to provide continuity. Options include short- or tall-post versions, wall-mounted, or a base-free for those wanting to construct something unique or utilize an existing feature. We also feel good about safety in design as the 18-inch tall open-air tempered glass works to prevent the flame from going out during high winds or rainfall and includes an automatic gas safety shutoff valve. Note that the torches can run off attached gas lines or a five-gallon propane tank. The variable flame reaches a height of 17 inches, kicks out up to 20,000 BTUs, and can be manually ignited with the built-in piezo igniter. 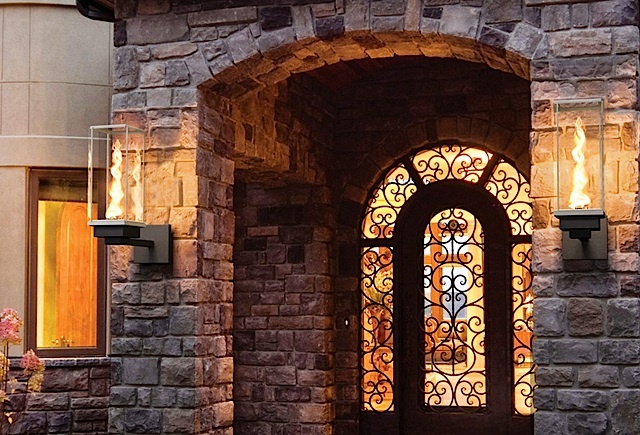 Practical and versatile, this type of inviting feature lights the way for an alluring evening outdoor experience. If you want to go beyond simply flowing water, illuminate it with HPC’s Evolution 360 Fire and Water feature! Perfect for any residential or commercial setting, these innovative fire and water effects add the sound of soothing water and brilliant blue LED lights to the warmth and romance of fire. If you’re wondering about where you’d find your water source, they’ve got you covered. You don’t need a pond or pool to use the Evolution 360 as they arrive fully assembled with a self-contained filtrated water system. Controlling the three elements — fire, water, and lights — is done via wall switch. For easy install just level the basin and connect the water, electric and optional gas. Then cover the structure with stone, veneer or stucco to suit your patio décor. This multi-purpose product, an industry winner of a Vesta Award for Best Outdoor Hearth Product, brings a focal point to outdoor experiences. Find your ideal hue of blue as you enjoy an experience that parallels the area’s finest outdoor patios. And then, you created fire. It can feel magical indeed. Especially when it’s the source of food for your friends and family. 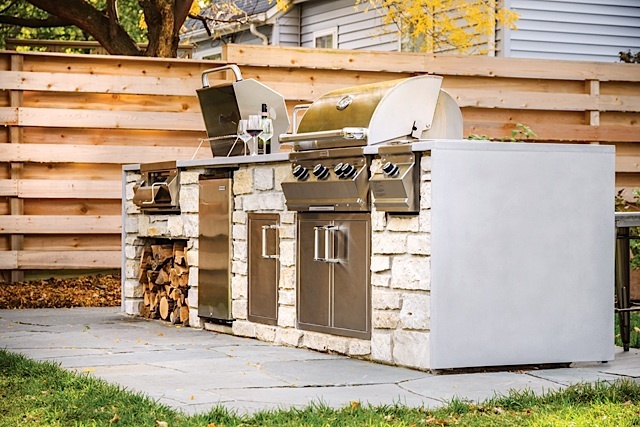 We’ve worked with enough clients who use their outdoor grills whenever they cook during Minnesota’s outdoor season to know that they’re looking for the highest quality and performance possible. One of our favorites is FireMagic. Not only does it deliver on grill options, it allows you to easily add on premium accessories from refrigerators to side burners. For today’s discerning outdoor cook, they like the grill’s ample cooking area complete with an advanced heat distribution system featuring proprietary stainless steel Flavor Grids that minimize flare-ups. They also love that they can grill, sear, smoke, rotisserie cook, and even use it as a charcoal grill! The control is in their hands as they go from 200 to 1,000 to bake a cake or sear a steak and serve up an entire meal all at once. Enjoying the outdoors and extending the season through the warmth of fire and movement of water has never been easier. You can start small and choose your priorities based on the core of the outdoor experience you wish to create. Working with a professional to envision a holistic plan is always a good idea. They can help you create a vision and consider a phased approach and budget. If you’re savvy, available and skilled to do some of the work yourself, there are many options to DIY components of your outdoor space. You could run with a landscaping plan and do your own plantings, or build out the stone that supports your outdoor kitchen area like homeowner Eric Peterson did (featured here). If you need help understanding how all of the products above would work in your specific space, work with an install professional. They can walk you through product selection and advise you, especially when you’re dealing with gas products including firetables and firepits that should be installed by a qualified gas technician. If you’re unsure of going the gas route, note that most communities are limiting wood fires so a gas appliance will be more usable and neighbor-friendly. Here’s to extending the summer season in Minnesota and accessing all of the elements, right in your backyard! Bonnie Hancock, co-owner of All Season’s Fireplace, is a design and installation consultant. In their new showroom at 6801 Wayzata Boulevard in St. Louis Park, ASF is committed to offering the highest quality brands of fireplaces, fireplace accessories, grills, and outdoor products offered by an array of esteemed manufacturers. Find All Season’s Fireplace at www.allseasonsfire.com, @AllSeasonsFire (Twitter), @allseasonsfireplace (Facebook, Houzz) and @AllSeasonsMN (Pinterest).